I grew up in a home that always smelled great because my mother was, and still is, a fabulous baker. I have memories of cookies, pies, cakes, cinnamon buns… just to name a few tasty treats. There’s nothing quite like fresh baking to make you feel at home the minute you walk in the door. Mmmmm! I can almost smell it right now. Am I making you hungry? lol. I guess that’s why when I see vintage baking thingies at the thrift store I feel drawn to them. They remind me of my mom baking in the kitchen when I was a little girl. I used to think it was such fun to sift the flour using a sifter much like this $2 find. I love it when things have such a great used patina. Love love love the red stripes. I can only imagine how many wonderful smells this sifter helped to create. But sifters aren’t just for sifting. 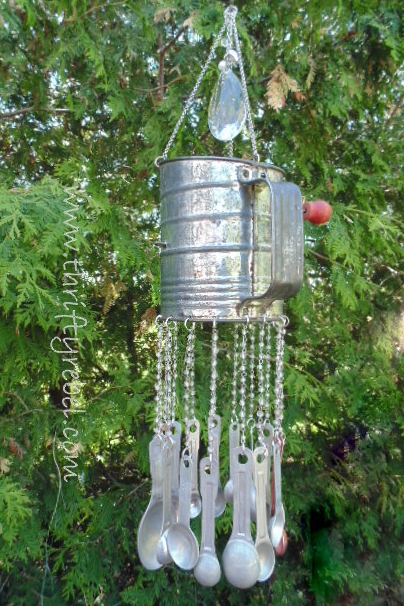 Old sifters can be repurposed into cool projects too… like my vintage sifter and measuring spoon wind chime. Or my very quick and easy Halloween Jack O Lantern. 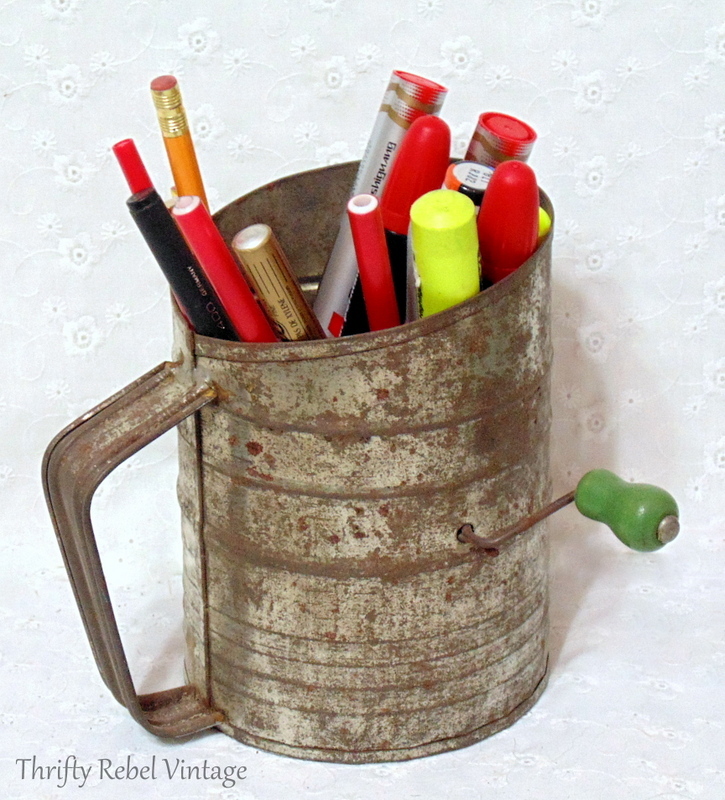 And this well worn beauty holds pens, pencils, and markers in my craft studio. Even though I love all 3 of those sifters. This beauty is my very favorite that I’ve found so far, and will go perfectly in my aqua and red kitchen. It’s especially sentimental to me because it was made in Toronto, Canada, and that’s where I was born and raised… and my mom still lives there in the same house. 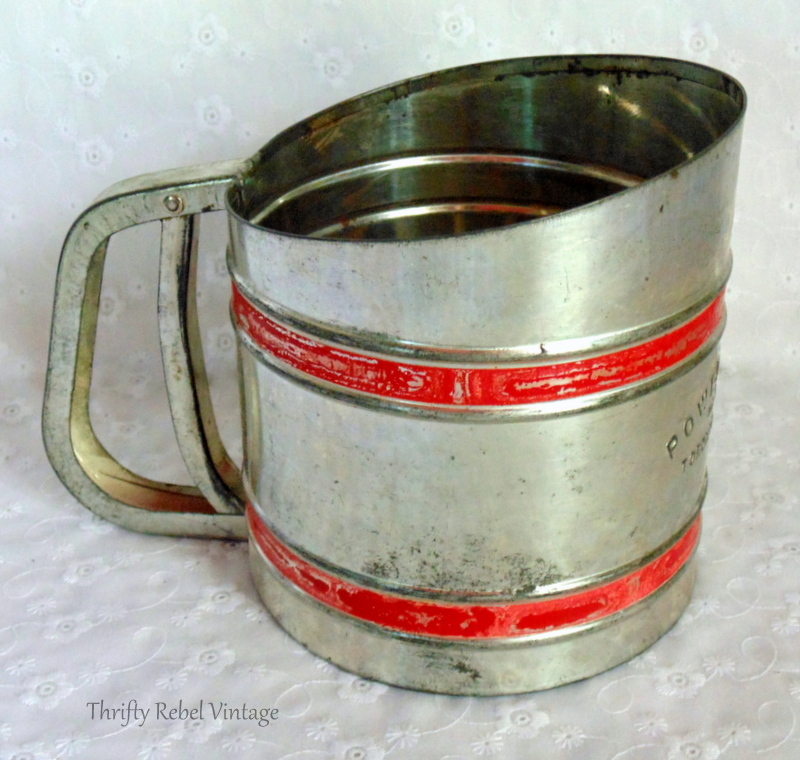 As a girl I could have been sifting flour for my mom’s baking using this very same sifter, and every time I use it I’ll be reminded of those wonderful smells of childhood. I can only think of one thing… still getting baking care packages sent home with us every time we visit. Yes! Memories never smelled soooo good. Will be married coming on 50 years come next year, and I still have and use my sifter along with other kitchen items that where given to me as a shower gift way back when. My sifter sits right beside my flour container in my pantry. 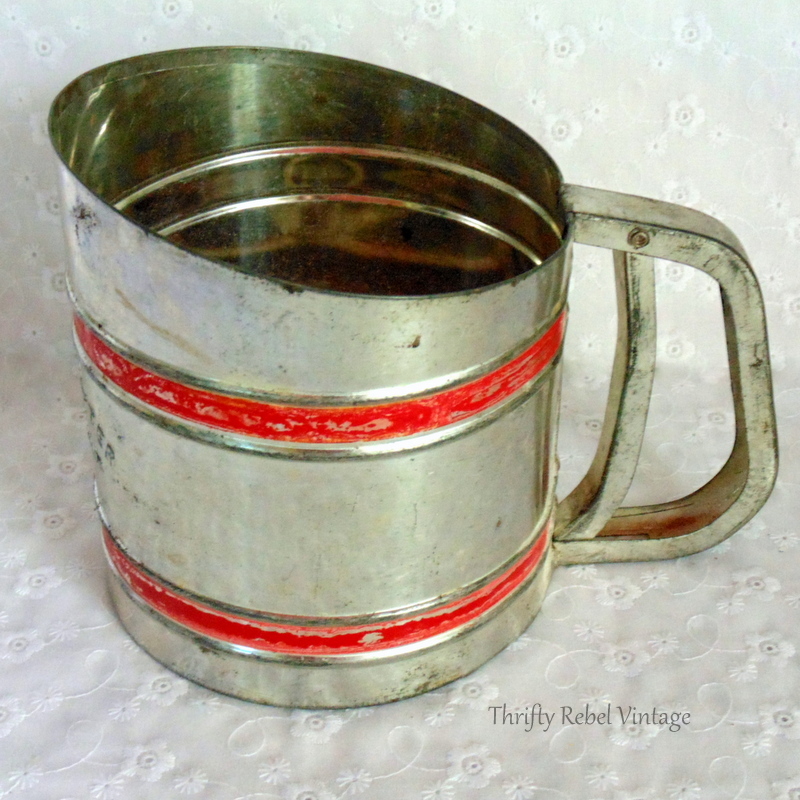 Old kitchen items is the first thing I look for when going to garage sales, thrift shops, antique places, etc. Just something about them old vintage kitchen items that turns me on. I have all my mom’s old cookie cutters of which are a real treasure to me. Ack. We could be twins…..if I hadn’t been born about 20 years sooner! 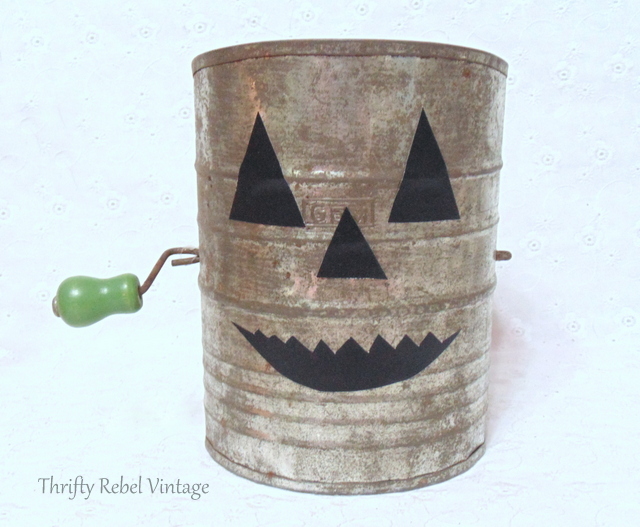 That is a spittin’ image of the sifter my mom used to use!!! I had it forever and can’t find it now. 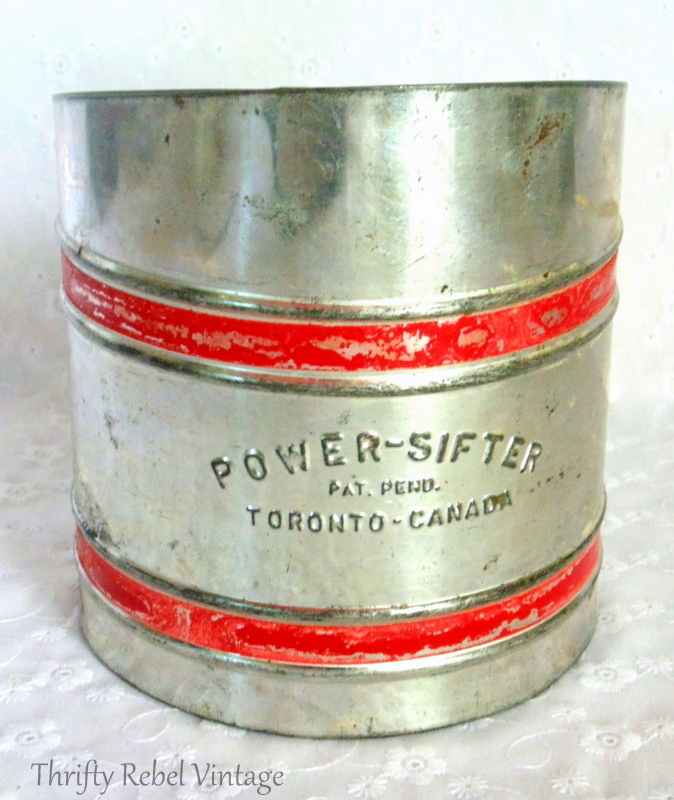 It didn’t say Power Sifter, though, but it DID have red stripes! And I know what you’re remembering about the smells!! Coming home after school there was always something good in the kitchen. I still have her huge bowl she used to make bread in. 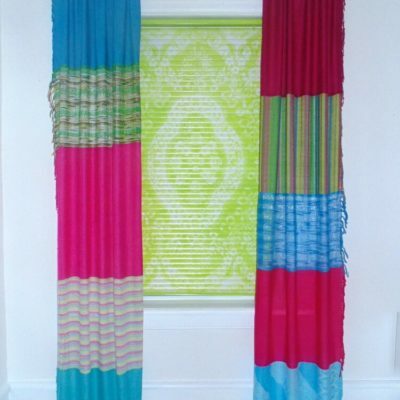 And to go one step further, there often was a new dress hanging on the door frame that she had made for me that day. 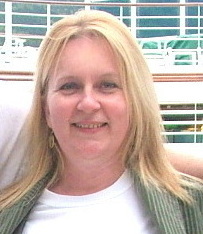 Oh, I do miss her so. And I’m 71! She died 30 years ago and I still miss her. Sigh. Thanks for the memories! Your Mom sounds like mine. There was always something baking. Then as an adult always getting sent home with goodies! In today’s crazy hectic world I know I’m also drawn to things that bring back memories. When we had to clear out the farm, after both of my parents passed, I got the real thing ♥ My sister and I shared things that brought back those sweet memories. Since we’re 10 yrs. apart, we had some different memories, we each wanted different things from the kitchen. We shared stories that each hadn’t heard. Yes, we cried, but could have been a free for all (as in my Grandmother’s case) turned into a memorable experience. All four are delightful. 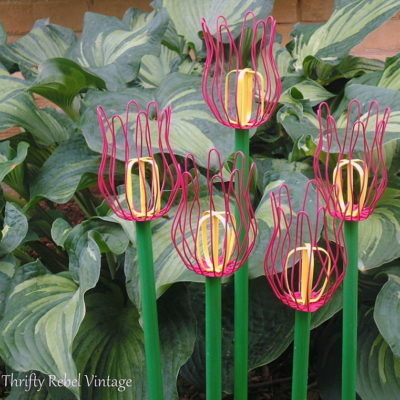 Especially like the windchime. I have a white and red plastic sifter just like my mother had. I do remember using it to make it “snow” in the big mixing bowl, over the beautiful soft yellow butter. Thanks for jogging my memory. Love how you tied your wonderful memories into your repurposed sifter projects, Tuula! Thanks Lora! The older I get the more I want the things that I have in my home to be meaningful, and not just things for things sake. And that is why I love vintage items, for all the great memories they create from your childhood. I have never seen a Power Sifter though! I am that Mom to my kids because I have always baked something while they were growing up. My girls love to bake now too.